On Thursday, March 25 the Honolulu Advertiser featured an article about the gathering of scholars around the world in Philadelphia. The occasion was the annual meeting of the Association of Asian Studies. The article disclosed for the first time that the annual meeting of the Association of Asian Studies will be held in 2011 in Honolulu. The 2011 annual meeting is scheduled for Honolulu from March 31, 2011 to April 3, 2011. The AAS hosts regional conferences. Click here for more information. Also, go to this link for Calls for Papers and meetings worldwide. What is Good Government?A Historical and Philosophical Examination of the American Political System. This free training will be conducted on July 19 and 20, 2010 at Aliʻiōlani Hale, home of the Hawaii's Supreme Court since 1874. Free transportation and lodging is available for up to ten neighbor island teachers. This is an excellent opportunity for teachers for grades 5 and 8 Social Studies, Participation in Democracy, and U.S. History and Government. We the People is a nationally acclaimed program that helps students understand the history, principles, and application of the U.S. Constitution and Bill of Rights. Participants will receive free classroom sets of We the People textbooks and instruction in constitutional history and theory, the Bill of Rights, citizenship, congressional hearings, standards-based lessons, and formative and summative assessment strategies. The workshop will be conducted by Robert Leming, the Director of the Center for Civic Education and Dr. Tom Vontz, Ph.D., Professor of Education at Kansas State University. Three PD credits are available. Those wishing to obtain PD credits must attend additional workshops on December 4, 2010 and May 7, 2011 and complete a PD portfolio. To apply for PD credits, you must sign up at this link. For more information please contact Sandra Cashman at cashmans001@hawaii.rr.com, or Keahe Davis at the Judiciary History Center, keahe@jhchawaii.net, 808 539-4999. Registration is limited and interested participants should complete registration as soon as possible. Have you ever considered a career in aviation? Are you curious about the role of women in aviation history? Would you like a unique chance to meet and talk to local aviators and aviation professionals? 9am-5pm ~ Enhanced Museum Exhibits ~ Get your picture taken with Amelia Earhart, Rosie the Riveter, and more! 10am-3pm ~ Seminars and Workshops ~ Share in the insights of local aviation professionals as they present on a variety of topics to guide young women and men toward aviation and other science-related careers. 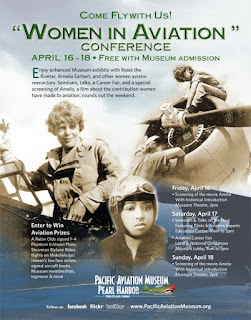 4pm-5pm ~ Women in Aviation Panel discussion ~ Unique opportunity to ask questions of local aviation professionals about their experiences and issues facing women in aviation today. 2pm ~ Sunday Matinee Movie: Amelia ~ Free with paid admission to Museum. General Admission includes one-day admission to Hangar 37 and all conference events. *One free child admission with each paid adult admission ticket. Regular military and kama'aina child admission price is $5.00. General Admission tickets available ONLINE at www.PacificAviationMuseum.org or at the Arizona Memorial Ticket Office. If you purchase online, print out your ticket voucher and hop the shuttle, avoiding the Arizona Memorial ticket lines. Check out our website for more information on admission, conference, and access to historic Ford Island. We'd like to call your attention to an editorial in today's Star Bulletin. Shelly R. Brown is president of the Librarians Association of Hawaii. She has argued that the state's public libraries, which operated under the Hawaii Board of Education, should be given autonomy. Go to this link for commentary. We'd like to call attention to a published article on Nisei Warrior Staff Sgt. Robert Kuroda that appears in Hawaii Reporter today. Duane A Vachon PhD works at the National Memorial Cemetery of the Pacific. Mr. Vachon has been writing a series of such articles under the title Remembering Heroes of the Pacific Now Buried in Punchbowl, the Puowaina Place Of Sacrifice. This month marked the sesquicentennial of the stopover in the Hawaiian Islands in 1860 by the first Japanese Embassy delegation to the United States. The Japanese Embassy was scheduled to visit San Francisco, Washington, D.C. and New York City. One of the ships was the U.S.S. Powhatan, which was one of Commodore Perrys Black Ships, and a Dutch-designed state-of-the-art steamship from Japan, the Kanrin Maru. On board the Kanrin Maru were the Japanese Minister of the Navy and Captain Katsu Rintaro along with American crew members from the Fenimore Cooper, which had been shipwrecked in Japan. Nakahama Manjiro -also known as John Manjiro- was aboard the Kanrin Maru, too. Years before he was a young fisherman who had been shipwrecked at the age of 14, rescued by Captain William H. Whitfield and taken to the United States. Manjiro studied English, and after his return to Japan was assigned to the embassy and served as a translator. Both the Powhatan and the Kanrin Maru encountered very rough seas. The Powhatan was in need to repairs. So as the Kanrin Maru continued on to San Francisco, California, the Japanese Embassy boarded the Powhatan and stopped in Honolulu for a visit that lasted almost three weeks. This visit was covered in the Honolulu press and caused quiet a sensation in the local community. The Japanese Embassy -as well as Admiral Tattnall and his officers from the Powhatan- were received at the Hawaiian Royal Court in the old Iolani Palace by Kamehemeha IV, Queen Emma, and other members of the Hawaiian Government. A lavish ball was held. On March 18, 1860 they departed Honolulu on the Powhatan for California, then on to cross Panama for the trip to Washington, D.C. and New York City. On its return trip the Kanrin Maru stopped in Honolulu on its journey back to Japan. The Consul-General of Japan in New York has a superb educational web site, though almost nothing is mentioned about the Hawaii visit. This official 150th anniversary web site is highly recommended. When I found out about this anniversary I also discovered that none of the local historical and cultural organizations picked up on this. I decided to have my students at Hawaii Tokai International College take this on as a class project. The students produced a vodcast-style newscast. In addition, the students and I alerted members of the Hawaii State Legislature of this important anniversary. The result was the Joint Declaratory Certificate pictured below, and I'd like to thank Hawaii Senate President Colleen Hanabusa and her staff for helping to produce this. My students and I presented the actual certificate to our Chancellor Naoto Yoshikawa. 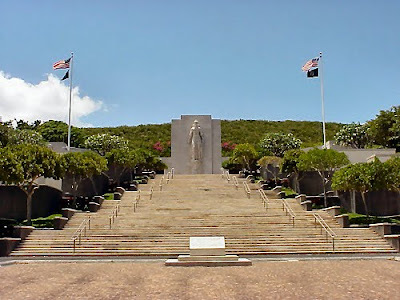 As president of the History Education Council of Hawaii I am seeking partnering individuals and organizations to hold some kind of event to honor this anniversary, perhaps in late May or June. Please contact HECH at historyeducationhawaii@gmail.com with your ideas, support and suggestions. We received word that the National Humanities Center will be at the annual conference of the National Council for History Education scheduled in San Diego later this week. Look for Carn Koplik, Editor, TeacherServe® and Marketing Coordinator, Education Programs. For more information on the National Humanties Center go to this link. The first group of papers to be presented at MW2010 papers are now on-line . All of the papers will be on-line before the meeting. Take a look and come ready to dive in to the issues. You can also search all past MW [and ICHIM] papers. MW2010 takes place at the Grand Hyatt, Denver and it's important for conference economics that you stay at the conference hotel. The MW2010 conference rate is available until March 17. If you shop around you might be able to beat this with a flight/hotel package or other offer, but please stay at the Grand Hyatt (your booking counts no matter how you make it). If you are coming to MW2010, please make sure to register in advance. You'll save a bit of money, and have an easier time when you arrive. Once again we will be asking for your opinion about the best museum sites on the web. Review the sites nominated for Best of the Web awards and figure out which is your People's Choice. Voting will be open April 1, 2010. If you don't have one, register for an account, so you can vote. We're hosting a pre-conference workshop at Museums and the Web 2010 that will bring together wikimedians and museum people from around the world. Our goal, through some face-to-face conversation, is move through some of the policy and procedural questions that have proven stumbling blocks to date, and scope out ways we can truly collaborate. In preparation for the workshop we're asking people to contribute their ideas and observations. We want to shape the agenda based on real issues and concerns, and need your input to be sure that happens. Join the discussions. As well as our own community at http://conference.archimuse.com, MW2010 can be found on Twitter [museweb]; Linked In [Museums and the Web group], Facebook [Museums and the Web page and Museums and the Web 2010 event], Upcoming [Museums and the Web event], Flickr [MW2010 group], and Slideshare [Museums and the Web group]. Join us there too! There are people from more than 22 countries already registered to come to Museums and the Web 2010. This contest invites students to write an essay of not more than 2,000 words (supplemented with a bibliography) on Historical Leadership. Using an event from the past students should write about how the leadership by a person or a group of people contributed to the development of society, and what today's leaders and citizens can learn from this. Students should feel free to explore any time period and a person or a group from any place in the world. A few examples are: Presidents (foreign leaders), Explorers, Inventors, Civil Rights Leaders, Doctors, Army Generals, Sports Figures, etc. Entries may be submitted in one or more of the following forms: 1) Microsoft Word document or 2) PDF document. All entries must be received by April 1, 2010 and can be emailed to Bob Nasson at rnasson@nationalhistoryclub.org (please type "LeadAmerica" in the subject line). The National Leadership Summit, hosted by LeadAmerica, provides high achieving students with the opportunity to build real world career skills and analyze leadership attributes within the environment of our nation's capital. For ten days, students participate in leadership case studies on individuals like George Washington and Abraham Lincoln, while debating current policy initiatives confronting the United States such as Health Care, National Security and the Environment through the National Leadership Summit campaign simulation. In addition to exploring policy, students practice skills central to future success such as coalition and platform building, networking, public speaking, conflict resolution and communication, while also visiting sites like Capitol Hill, Mount Vernon and the Smithsonian Museums. Students also complete LeadAmerica's leadership curriculum through engaging activities and a ropes challenge course, which foster necessary skills such as teambuilding, time management and culminate in the formulation of a personal mission and vision statement. To learn more about LeadAmerica and the National Leadership Summit, please visit http://www.lead-america.org/conferences/nls/nls_hs.asp or contact an Admissions Counselor at 866.FYI.LEAD. As a result of our recent partnership with LeadAmerica, I am excited to announce a very special opportunity available to the students, teachers, and partners of the National History Club. In addition to sponsoring our 2010 National History Club Essay Contest, LeadAmerica will also provide a $250 grant towards any LeadAmerica conference for students of educators affiliated with the National History Club. · Explore exciting career paths. LeadAmerica programs are often described as "life-changing" and offer incredible experiences that can set students apart as college applicants and young leaders. To learn more and to obtain your student grant code, please contact a LeadAmerica Admissions Counselor at 866.FYI.LEAD or visit their website at http://www.lead-america.org/default.asp. The Gilder Lehrman Institute of American History has just published its latest edition of History Now with Issue 23, March 2010: Turning Points in American Sports. In this issue, History Now examines a topic near and dear the hearts of students: sports. As fans, athletes, or teachers, we know that sports provide us with valuable lessons in team work, self discipline, and the ability to accept both victory and defeat with good grace. But how many of us realize the value of sports history in our classrooms? Our contributors, including New York Times columnist Gail Collins, examine important turning points in American sports, illustrated by video clips. On March 15-16, 2010, the Hawaii Department of Education's Teaching American History Grant (TAHG), in partnership with the Friends of the Judiciary History Center and the Hawaii Council for the Humanities (HCH), will hold a partnership training session titled "Religious Diversity: A Driving Force for Liberty in America". Professional Development Opportunity open to all Grade 5, 8, and High School U.S. History, Participation in Democracy, and World History Classroom Teachers. Professor Margaret Hill of the California State University at San Bernardino will help teachers understand the historical origins and context of religious diversity in both the British colonies and the United States. Participants will have the opportunity to collaborate with their colleagues and We the People State Coordinator Sandra Cashman to design effective ways to teach the subject matter in the classroom with students. Sample Hawaii Content and Performance Standards (HCPS) III standards-based lesson plans will be distributed and strategies will be provided to help participants develop and implement their own HCPS III standards-based units on the content presented. Applicants must agree to attend on both days, implement the units during the appropriate quarter, and provide student work with teacher commentary that meets the targeted benchmarks. Certificates from this training session will be given to all participants and may be used as evidence for social studies teachers who are not yet Highly Qualified (HQ). Donʻt miss out on this great opportunity for FREE Professional Development! Enrollment is limited to forty-five teachers and participants will be accepted on a first-come, first-served basis. Please fax the Intent to Participate Form by March 9, 2010 to Rosanna Fukuda at 735-8227.